I would like to send out a big THANK YOU for all the Kindergarten, First Grade, and Second Grade teachers who spend so much time working with our young students with phonics, phonemic awareness, fluency, vocabulary, spelling, and reading comprehension. In a computer and video game era, it seems hard to motivate kids to read. Below you will find phonics worksheets, alphabetical order worksheets and abc order worksheets, grammar, language arts, and parts of speech worksheets, and spelling worksheets and activities. Free ABC Order Worksheets - These alphabetical order worksheets are great for learning dictionary skills. Students can learn abc order by the first letter, second letter, and third letter. Free Grammar and Language Arts Worksheets - Here you will find 5 different worksheets teaching synonyms. A synonym is a word that means the same or similar as another word. These worksheets are fun, colorful, and engaging. Students can create a story and draw a picture. 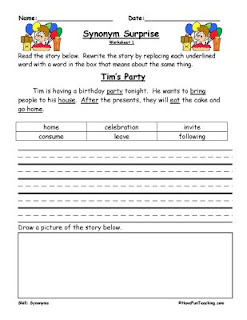 Free Parts of Speech Worksheets - Click this link to get free noun worksheets and free verb worksheets to help teach the parts of speech in a fun and interesting way. Free Phonics Worksheets - Here you will find free worksheets for Beginning Sounds, Ending Sounds, Blends, Vowel worksheets and Consonant worksheets. Free Spelling Worksheets and Spelling Activities - Spelling Soup is a fun daily spelling activity for studying spelling words. You will also find here a spelling vocabulary worksheet template where students write their spelling word, definition, and they can draw a picture of the word. Thank you, this is a great resource website. Thank you. Your website is full of great resources. Good work! This is a great resource website for teachers.Keep up the good work!!! May I know what country is this?